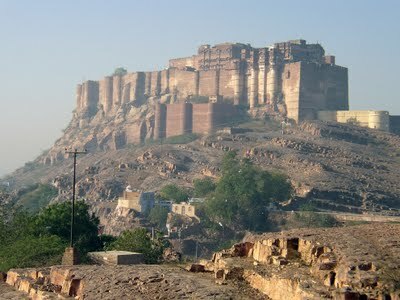 Location: Jodhpur is the second largest city of Rajasthan. It is situated on the western border of India, on the edge of the Thar desert. The ancient capital of Marwars has cenotaphs of the Jodhpur rulers. The highlight of this place is the Hall of Heroes which houses 16 gigantic figures chiseled out of single rock. The statues are either of popular Hindu deities or famous folk deities. Devals or the royal cenotaphs in the form of temples were built in the memory of Maharaja Jaswant Singh and Ajit Singh. 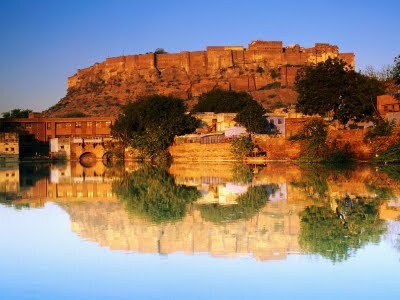 They reflect the glory of Marwar.The beautiful gardens with high rock terraces make it popular. The garden has a gate known as the Ajit pol which is decorated with figures of Gods and Goddesses from Indian mythology. Nestled in the city of Jodhpur, The Ummed Jodhpur, is set amidst 28 acres of landscape gardens. The hotel is constructed around a central courtyard in the true Rajasthani style. Build on the concept of a palace, the design bears true testimony to the architectural heritage of Jodhpur. Located 12 Km from the airport and 8 Km from the Railway station, the Ummed Jodhpur offers a perfect setting to experience the rich culture and traditions of Rajasthan. 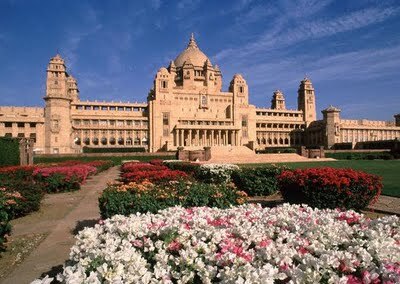 Perched high above the desert capital of Jodhpur, Umaid Bhawan Palace is the last of the great palaces of India and one of the largest residences in the world - set amidst 26 acres of lush gardens.Umaid Bhawan offers a wide range of personalized services and facilities to help make your stay in Jaipur a memorable one. The Swimming Pool Enjoy a rejuvenating swim in the azure depths of our swimming pool. Or you could just choose to sit by the pool and read a book. See more pictures of our pool in the picture gallery. Business Center / Internet Cafe Stay in touch with the world even as you lose yourself in the fantasy that is Rajasthan. You always have the option of connecting with friends and family, wherever they may be. Our modern business center has everything you need. While you may choose to stay in your room to make long distance calls, we also have an Internet Cafe where you can surf the net, chat with friends, and exchange email while enjoying a quite cup of coffee. Roof top Restaurant A section of the lounge Dining at the Umaid Bhawan Umaid Bhawan has a delectable range of Indian cuisine on offer. Enjoy the food prepared for you by our traditional cooks and supervised by the lady of the house while absorbing the traditional ambience of our cosy and private dining room. You could also choose to sit outside and eat while enjoying a puppet show. Set amidst six acres of landscaped gardens, the hotel makes lavish use of exquisite marble in an architectural style, which harmoniously bends an Old World charm with contemporary elegance. We are proud to introduce ourselves as True hospitality Ambassador and specialize in all aspects of hospitality.Shree Ram International is located in the desert city of Jodhpur. Its tranquil gardens provide guests quiet elegance in the heart of the city. Shree Ram International comprises of 50 well appointed centrally air-conditioned rooms with four elegant suites,"Padharo Sa"- A 92 covers vegetarian multicuisine restaurant offers Indian, Chinese,Continental food in true Rajasthani decor and hospitality,a boutique swimming pool and lush green lawn for a gathering of 500 to 5000 people.